One of the most useful items to own as a new parent is a comprehensive book on children’s health. The internet and well-meaning friends and families do not always have their facts straight. A reference manual can help decide when there is a cause for concern or not. 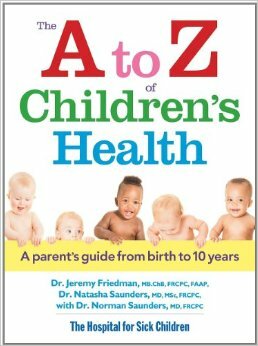 We were sent a copy of The A to Z of Children’s Health: A Parent’s Guide from Birth to 10 Years to review. Down syndrome, head lice, separation anxiety, shingles. There are photographs and diagrams featured throughout the book, making it easy for parents to accurately pinpoint what potential condition and/or illness their child may be experiencing. An extensive glossary of terms combined with a well-organized index complete this valuable guide. This book’s layout is easy to use and informative. It even has graphic photos of what breastmilk mustard poo looks like and meconium! This book gives practical advice, as expected, such as babies only require breastmilk the first six months of their life but may need a vitamin D supplement. From bedwetting to Autism Spectrum Disorders, the breadth of topics covered is full. I may not agree with every statement, but it is a good solid book with advice and information to help parents as their child grows. There is no information under the speech and language problems about my son’s condition childhood apraxia of speech. I find that a little surprising. There is also no mention of congenital heart conditions. There is a section on strabismus…one out of three ain’t bad. Thankfully, celiac’s disease is included (something you won’t find in older manuals). There is a lot of good information in The A to Z of Children’s Health: A Parent’s Guide from Birth to 10 Years, and I especially appreciate the photographs like the ones demonstrating how to treat a choking child. It seems to give good, classic, cautious advice. This is not an alternative medicine manual, but I think it is important to consult books like this one to make an educated choice about treatment options for your child. It also helps to be informed when you talk to the pediatrician. I had baby last year,I think i should read this a-z guide.thank for sharing,Jennifer!